Tesla will have a new $129,000 rival soon. 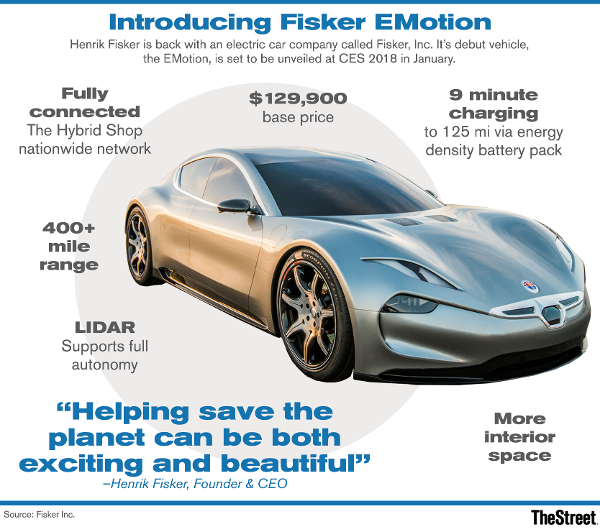 The EMotion is set to debut at CES 2018 in January, well-known auto maker Fisker told TheStreet in an interview. Fans can get a firsthand look at the $129,000 vehicle that's expected to rival Tesla Inc.'s (TSLA - Get Report) Model 3 and the Faraday Future FF 91. Fisker Inc. will also be showing off some of the EMotion's next generation technology, including the energy density battery pack, which he promises will be superior to existing EV technology, charging the car in just 9 minutes, as well as LIDAR technology that, while still in development, will drive the car's level 4 autonomous system. Fisker says the car has a range that exceeds 400 miles.